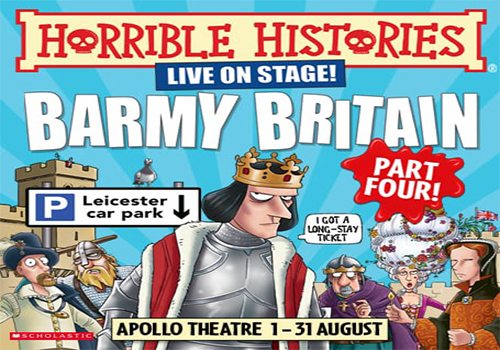 Family favourite Horrible Histories is back on the London stage with their show Barmy Britain Part 4. The Birmingham Stage Company's production celebrates its seventh sensational year in the West End and plays for a strictly limited summer season. We all want to meet people from history. The trouble is, everyone's dead! But don't worry, Horrible Histories gang are back to help you meet the heroes, villains, kings, and queens of the past - complete with plenty of gory facts and lots of laughs! Survive one of King James I's witch hunts and mount a mutiny against Henry VIII! Meet Richard III and take a look at Elizabeth I's terrible teeth! Look into the world of Samuel Pepys and see Mary Tudor knock the spots off Mary Queen of Scots! Help Georgian detectives find a headless man and take a trip with the night soil men and learn how to survive the first ever train ride! And finally, find out which King was found buried in a car park. Horrible Histories - Live On Stage! is based upon the best-selling book series by Terry Deary and created by Neal Foster. The production stars Ben Martin, Pip Chamberlain, and Jamie Sheasby, and features set/costumes by Jacqueline Trousdale, lighting by Jason Taylor, and sound design by Nick Sagar. A hilarious, entertaining, and educational show, Barmy Britain Part 4 brings history to life and keeps all the nasty bits in. It plays at the Apollo Theatre for a limited season from August 1st - 31st. Audiences aged 5 - 105 will love this show!